SlottyVegas Casino opened its doors in 2014 and quickly moved up the ranks of popularity among online casino players. The main reason for this is that SlottyVegas Casino offer a great website which is fully supported across all devices and operating systems, massive bonus promotions and an impressive portfolio of several hundreds of top-quality online casino games. The game platform includes games from some of the most thought after game producers including NetEnt, Microgaming, 1×2 Gaming, Leander, NextGen Gaming, Yggdrasil, Quickspin, ELK Studios, Big Time Gaming and plenty more. SlottyVegas Casino is also a great place to enjoy the excitement of playing live-dealer games via a video stream provided by Evolution Gaming and NetEnt Live. The larger part of the game portfolio is video slots but there’s also a good collection of table/card games and jackpot slots. SlottyVegas Casino’s game lobby is easily navigated and there is a great search function where you can simply search by the game title. Above the lobby, players can use a volatility bar to filter the games according to their preference; more wins to bigger wins. You can also filter the lobby by game types such as video slots, jackpots, live casino, classic slots and table games. The customer support at SlottyVegas Casino has a great reputation for being very friendly and professional. The helpdesk is available 24 hours a day, 7 days a week. The quickest way to contact them is by using the live chat function which is located in the bottom right corner all over the website but they can also be contacted by using e-mail (see above for e-mail address). SlottyVegas Casino is currently available in two languages: English and Russian. SlottyVegas Casino is operated by Max Ent Limited which is a company registered in Malta. They are licensed by the UK Gambling Commission and the Malta Gaming Authority. SlottyVegas Casino meets the highest standards of player safety, fairness and responsible gaming. SlottyVegas Casino: Get 25 EXCLUSIVE NO DEPOSIT SPINS in Starburst as a NEW member! – Non-Deposit Free Spins must be used within 7 days of being credited. – Winnings derived from promotional free spins will be converted to bonus funds with a wagering requirement of x30 the value won. The requirement must be met to convert the winnings to real funds. – Real funds do not contribute toward the wagering requirement of this bonus. – Withdrawals from winnings originating from Non-Deposit offers are capped at a max of €/£/$20/Kr200. Click here and become a member of SlottyVegas Casino and get your 25 No Deposit Spins Immediately! 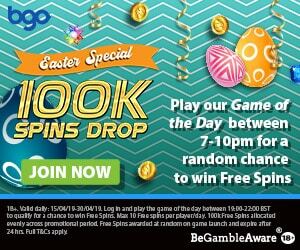 SlottyVegas Casino: First Deposit Bonus of 100% up to £/€/$500 + 50 Free Spins on Game of the Week! – This offer is not applicable for deposits using Neteller, Skrill and Ecopays. – If you choose to accept this bonus, a sum equivalent to x30 times the bonus amount must be wagered on Eligible Games within seven (7) days of accepting the bonus in order for the bonus funds to become withdrawable. – The maximum bet applicable for these bonuses is in the value of €/£/$5.00/Kr50/Rub375. Any bet larger than the stipulated maximum amount will contribute towards any winnings, however only the maximum amount of €/£/$5.00/Kr50/Rub375 will contribute towards the wagering requirement. Click here and join SlottyVegas Casino and get 100% up to £/€/$500 + 50 Free Spins on your First Deposit! SlottyVegas Casino: Get Supercharged™ Wins on your winnings! 1. Play any game with the “Supercharged™ Wins” icon! 2. SlottyVegas Casino adds every winning spin with extra funds, on the house! 3. Redeem your “Supercharged™ Wins” as real cash 17:00 CET the following day! This promotion is subject to specific terms and conditions. Cashback Guarantee at SLottyVegas Casino! In relation to the “Supercharged™ Wins”, SlottyVegas does not only treat the winners with extra treats; if you’re playing the Supercharged™ Wins games and you don’t win then you can get a 10% Cashback Guarantee on your losses the following day. All Supercharged™ Wins and Cashback Guarantees are credited to your player account as real cash – not subject to ANY wagering requirements. SlottyVegas Casino accepts deposits and withdrawals from all major payment methods including credit/debit cards, e-wallets like NetEller, Moneybookers Skrill (deposits made using these methods are not eligible for bonuses), direct bank transfers. They also offer several funding solutions that may vary from one country to another like Klarna, WebMoney, Monet.ru, Zimpler and eco. All transaction and other stored information is protected by the most secured encryption technology available. Popular Online Video Slots at SlottyVegas Casino! SlottyVegas Casino house a large number of online video slots which are provided by market leading game vendors such as NetEnt, Microgaming, ELK Studios, NextGen Gaming, Quickspins and others. This means that members of SlottyVegas will be able to enjoy the latest and most popular video slots on the planet. The most popular video slots at SlottyVegas Casino at the moment are Starburst, Planet of the Apes, Lucky Koi, Machine Gun Unicorn, Dead or Alive, Gonzo’s Quest and Jungle Spirit.